With a special interest in learning and the brain, Educational Consultant Kristine Scharaldi offers practical tips for cultivating joyful education in your classroom to improve learning outcomes. As educators, we take learning seriously. But that does not mean that learning must feel like serious business for our students. Studies show that when we provide joyful learning environments and experiences for our students, we can improve engagement, motivation, and learning outcomes. a learner’s comfort level has a measurable impact on processes through which information is transmitted and stored in the brain. an emotional state of stress blocks new learning, retrieval, and higher-order thinking. strong positive emotions are associated with increased retention of learning. Feelings of pleasure are associated with higher amounts of dopamine in the brain, a neurotransmitter that has been found to increase with activities like playing, exercising, laughing, acting kind, and having choices as to how to participate. Studies show that motivation, attention, perseverance, and creativity go up when dopamine is elevated. So, incorporating dopamine-enhancing classroom activities is a way to improve outcomes in your class. This is the basis of joyful education. 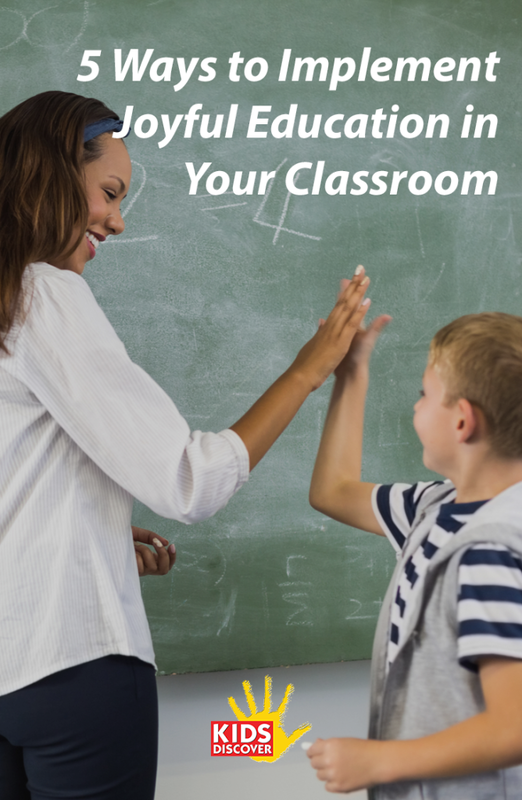 Revamp your classroom to appeal to your students. Creating an inviting classroom where students feel happy and comfortable helps to lower feelings of stress and increase positive attitudes about learning. Our students may have any number of struggles that make it challenging to be successful in school. Certainly, there are factors impacting our students that are out of our control. But we do have the power to create a welcoming, supportive, and interesting place for them to learn. When we make the classroom comfortable and appealing to kids, it can help cultivate a caring environment. It’s no wonder that classroom design is a popular trending topic on social media these days — flexible seating and taking classes outside when possible have become popular ways to shake up classrooms and refresh learning routines. This doesn’t need to be a tiring redecoration process. Get inspired by simple tweaks to your classroom and you’ll notice a big difference. Paying special attention to the learning materials you use in class is also part of designing a joyful classroom. We can create and use content that appeals to our students. Third-grade teacher Mike DeMaio, for example, makes customized videos that include multiplication songs, funny animations, and lessons with favorite puppet characters. He has found that students not only respond positively to the movies but have shown improvements in retention and understanding of the concepts after lessons. Another great example is educator Abran Maldonado, who created the website NuSkool to connect curricular topics to popular culture. He uses entertainment as a starting point in lessons such as The Science of The Force (Star Wars) and From Clicks to Cash: How Much Money Can You Make on YouTube? His site is a great example of a student-centered approach that connects real life to learning while valuing what is interesting to our young people. Add surprise and novelty to everyday lessons. The brain automatically filters the stimuli in our environment and alerts us when there is something different or unexpected around us. We become aware and curious about sights, sounds, and other sensory input that seems unusual. So, to draw student attention to the learning concepts and materials, we can intentionally introduce compelling things in the classroom. Arrange for a neighboring teacher to come and knock on the classroom door at a certain time to deliver the “word of the day” or another relevant concept. Partner with your music teacher and have them deliver a musical telegram pertaining to the day’s lesson. Place a wrapped box in the room to be opened when the time is right: it can reveal an object or clue about what’s coming next. Adding new and exciting things in the classroom helps to gain students’ attention while creating fun times and lasting memories of what they’ve learned. Make learning experiences relevant to the group’s interests. We can’t assume that we know what is interesting and enjoyable to our students. To best understand what our students like and care about, it is important to get to know our students better and take notice of what they are happy about. Invite students to share their interests and favorite things, and offer choices as often as possible for them to investigate, respond and create in ways that matter to them. As educator Mari Venturino recently wrote in her blog, seeking feedback from students is a great way to gauge your kids’ changing interests throughout the year. It also can help you get a handle on how you’re doing as a teacher! Remember, you can’t please everyone, but you’ll find some trends in what your students are getting into that will help lead you forward. In addition to evaluating your own teaching, turn the lens around on your students! It’s important to make them feel that in your class it’s normal to make mistakes and discoveries during the process of learning. They can learn from mistakes through some simple reflection strategies. When we all take a look back at how we’re doing together, we build a climate of trust and acceptance. This helps to reduce anxiety and tension for everyone. Get moving with your students whenever you can. For Physical Education Month, I wrote an article for Kids Discover about the science of improving cognition through physical activity in the classroom. The benefits of physical fitness fit right into joyful education. Besides lowering the risk of many diseases, research suggests that physical activity also positively impacts the brain and improves cognition, mood, attention and academic achievement in students. Read more here. How do you create an environment of joyful education in your classroom? I’m sure there are many things you’re already doing that promote joyful education. Share your ideas on Twitter @kscharaldi and @KIDS_DISCOVER.